Making a statement without subtlety, the LS4 delivers outstanding performance matched with elevated style. 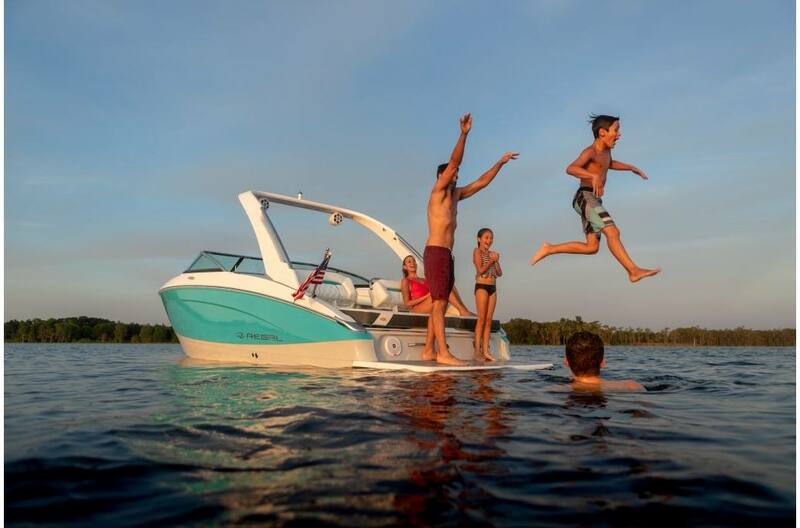 This 24-foot bowrider is thoughtfully crafted with means of ultimate versatility without compromising your space or comfort. With innovation and Regal luxury integrated into every element of its design, the LS4 is nothing short of exceptional. Beautifully Sculpted Body Lines: Incredible styling. Incredible spaciousness. Incredible comfort. 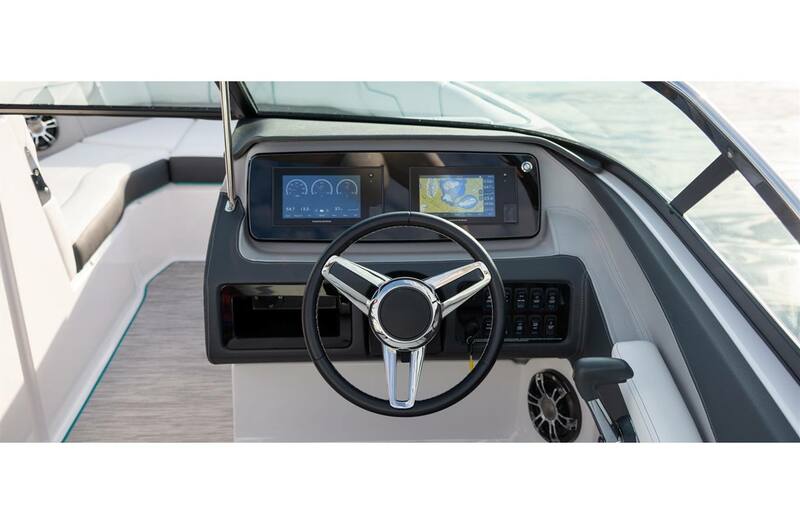 Dual Screen Display: Upgrade your dash and your experience with the dual Garmin displays available at the helm. Premium Crafted Cockpit: The cockpit seating boasts unmatched craftsmanship in its details and unrivaled comfort to match. 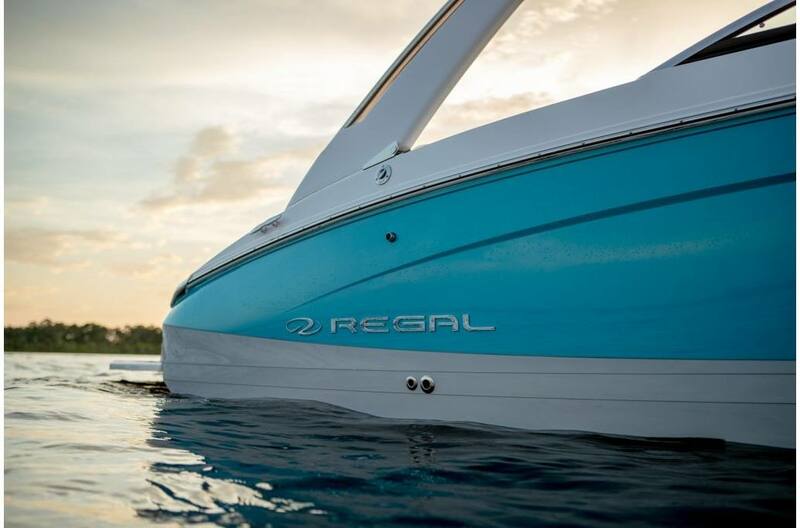 Versatile Transom: The LS4 features the most versatile transom in its class with not only dual multi-position UltraLounges and a low-to-the-water swim platform, but also two fold-away rumble seats. Edge-To-Edge Seating: A completely reimagined and redesigned cockpit layout to provide 31% more storage capacity, 11% more seating space, and a six inch wider interior beam. Automatic Bilge Pump: The automatic bilge pumps take action before you even realize you need them. Double Wide Helm Seat: At the helm, the Captain enjoys both maximized space and comfort. Double Wide Social Seat: The multi-position seat converts from a cockpit lounger to a forward facing seat big enough to share with just a flip of the backrest. Edge-To-Edge Seating: The cockpit of the LS4 has been completely reimagined and redesigned to provide 31% more storage capacity, 11% more seating space, and a six inch wider interior beam. Fusion Marine Sound - 6 cockpit speakers: The best sound begins with the best equipment. Set the atmosphere with the perfect soundtrack with the help of six 200 watt cockpit speakers with an IP65 waterproof rating. Premium Crafted Cockpit: The Regal LS4 boasts unmatched craftsmanship in the details and unrivaled comfort to match. Stainless Hand Rails: With Regal hand rails, durability and style come hand-in-hand. Transom Walk-Thru: The transom walk-thru makes boarding easy and keeps the upholstery clean. Blue Back-lit Dash: Illuminate your dash with just the push of a button. Hand-wrapped Steering Wheel: Regals feature a premium hand-wrapped steering wheel for the utmost comfort and control. 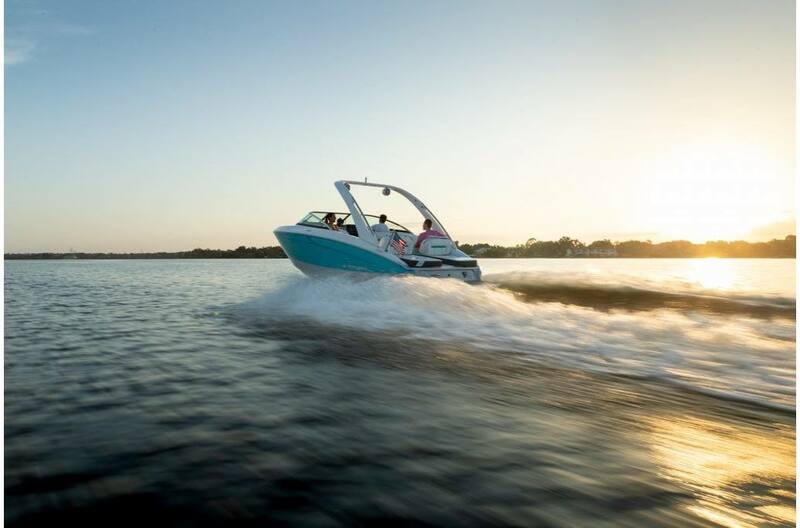 Dual Screen Display: Get the most out your helm with the dual Garmin displays. 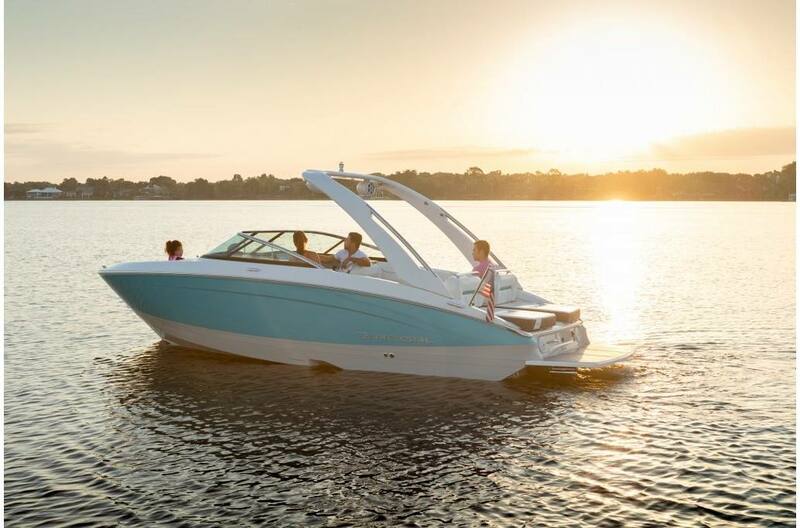 Single Screen Display: The Garmin 742 navigation system is equipped with a high-resolution 7-inch touchscreen with all of its intuitive controls at your fingertips. Premium Helm: Hand-wrapped, hand-stitched vinyl meets sleek metals to please the hand and eye. 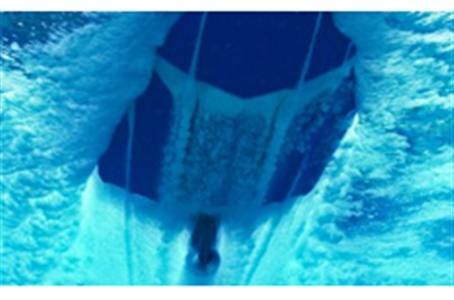 Bow Anchor Locker: A dedicated bow anchor locker will keep you from dragging a wet anchor through the boat. 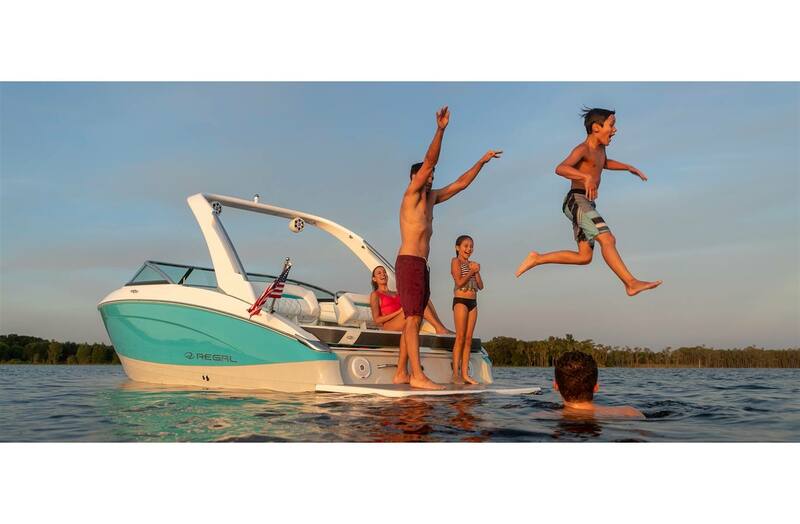 Optional PowerPlatform: With the touch of a button, gently submerse the platform underwater for easier water and boat entry. PowerTower Canvas Sunshade: The Bimini top features Sunbrella canvas and stainless bows and will shade the entire cockpit on a warm day. 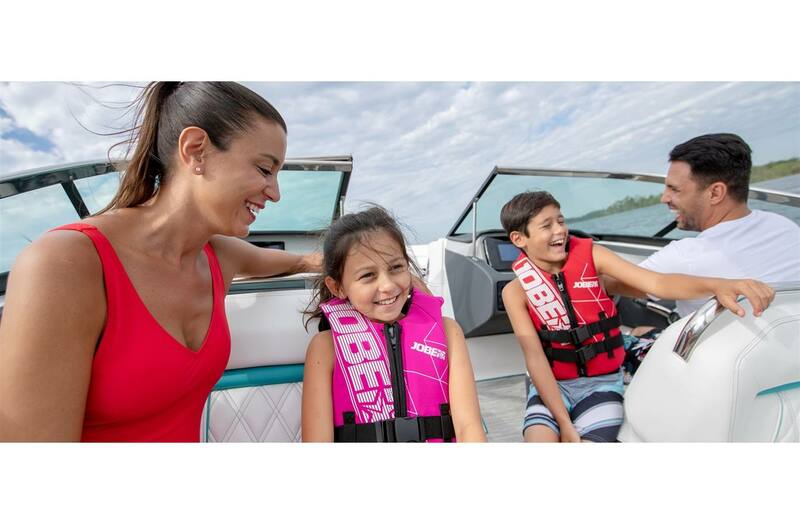 Battery Charger - For worry-free boating, the battery charger is a must. No need to be concerned with batteries being up to capacity. 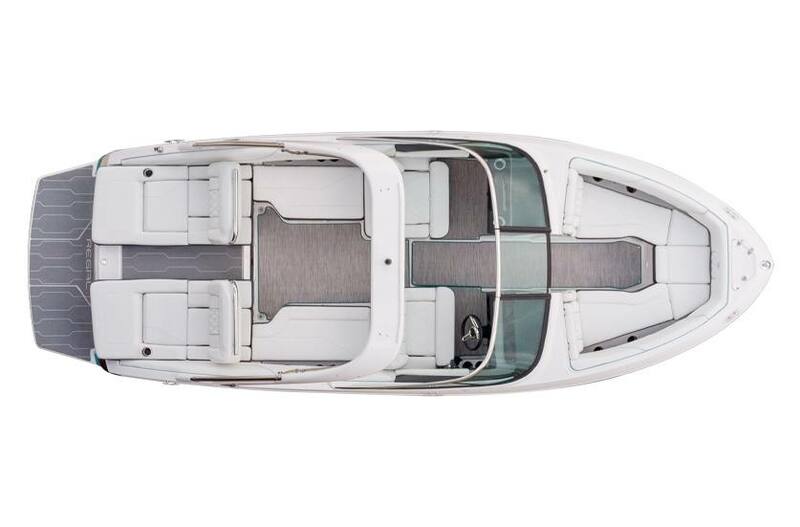 Volvo OceanX - Protected by a revolutionary titanium-ceramic coating and new sensor technology, this is the answer to the corrosive effects of salt water. 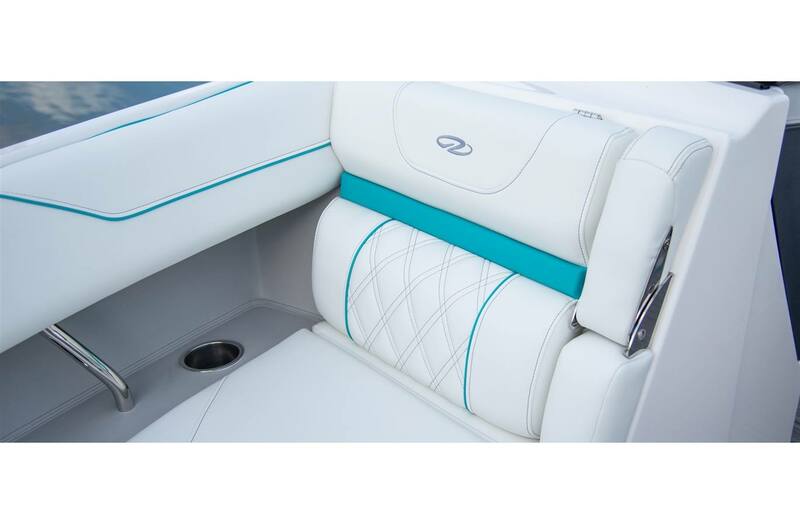 Aft Bench Filler Cushion & Backrest - Connect the dual UltraLounges and seat more people on the aft bench seat with the filler cushion and backrest. SeaDek Cockpit Sole Mat - SeaDek is soft and comfortable on bare feet, non-skid, shock absorbent and easy to clean. Hitch - A combination of cool grey and light tan for an airy and elegant look. 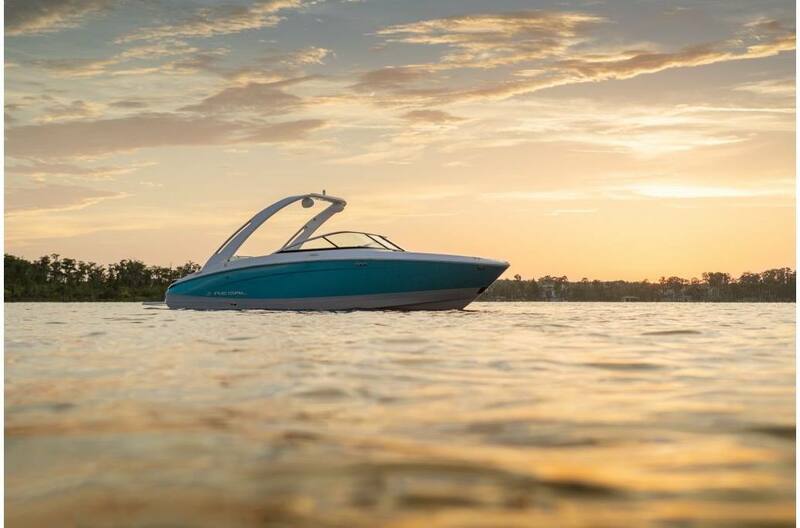 Titanium with Bimini Blue Accents - A combination of light grey, energizing blue and white for a refreshing and crisp look. Titanium with Newport Blue Accents - A combination of charcoal, light grey, white, and color matched accents give a cool sporty look to your cockpit. Titanium with Orange Accents - A combination of charcoal, light grey, white, and color matched accents give a cool sporty look to your cockpit. Titanium with Red Accents - A combination of charcoal, light grey, white, and color matched accents give a cool sporty look to your cockpit. 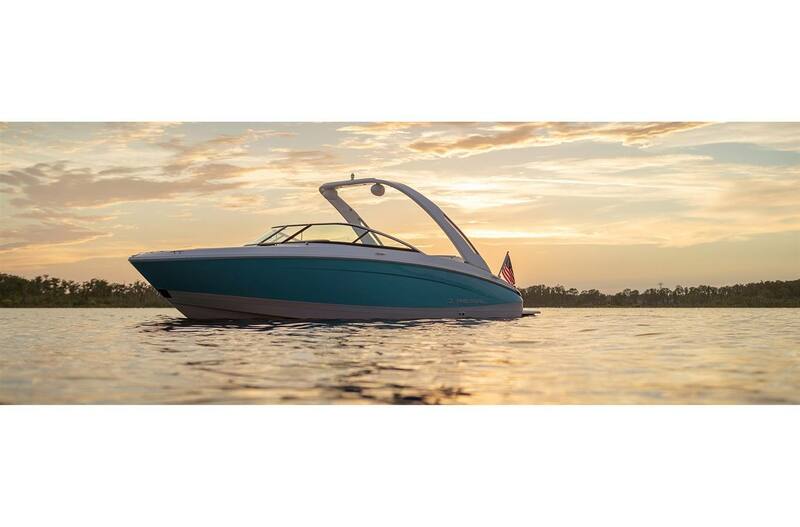 PowerPlatform - With the touch of a button, gently submerse the platform underwater for easier water and boat entry. 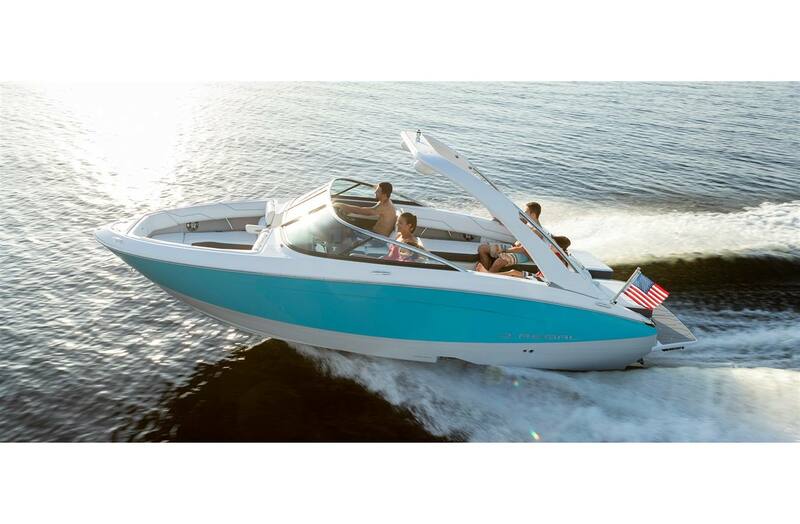 Sport Graphics - Make a bold statement on the water by opting for sport graphics. Dual Garmin 742 - Experience an advanced navigation solution with a dual touchscreen combo. Garmin 742xs + B60 Transducer - Experience an advanced navigation solution with this compact 7-inch GPSMAP 742xs touchscreen combo. Garmin 742 - Experience an advanced navigation solution with this compact 7-inch GPSMAP 742.